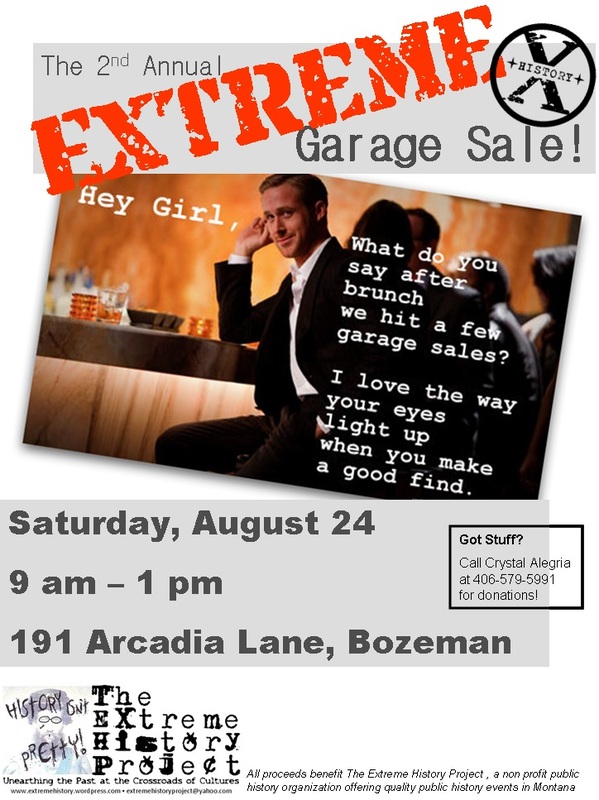 Join us for our 2nd Annual EXTREME Garage Sale! Everything under the sun! If you can’t find it here, it doesn’t exist! Our event would make a perfect companion to yours. Take an August tour of the historic sites in Gallatin Gateway, Montana! The Historic Preservation Board of Gallatin County will be offering its second Historic Tour and this year’s focus is on the Gateway Area south of Bozeman on Saturday, August 24, 2013 from 12 – 4pm. This tour includes several places which may have been restored to capture a moment in history or have been re-purposed to retain the character of original structures. The cost of the tour is $10.00/ person (Under 12, free). Tickets will be available for purchase at the Pioneer Museum in Bozeman, the Belgrade Chamber of Commerce and the Gallatin County Courthouse, Commissioner’s Office during operating hours. Tickets can also be purchased at each site the day of the tour. People need to provide their own transportation to and from the sites and parking is available. This year’s docent-led tour includes: The Gallatin Gateway Inn (outside displays), The Gallatin Gateway School, The Little Bear School House Museum, The Salesville Cemetery, Stacy’s Bar ( which was once a bank), The Damon Gabriel Homestead, A log trapper cabin and the Pine Butte Schoolhouse on Norris Road. The HPBGC is the principal resource to the Gallatin County Commission and its citizens for stewardship of historic places in Gallatin County. Its mission is to help preserve the heritage by recognizing, promoting and publicizing historic districts, sites and structures. The county board is to ensure public awareness toward and preservation of the county’s historic heritage. Please join the Preservation Board of Gallatin County on Saturday, August 24, 2013 for this delightful experience. For more information about the tour please call 406-388-2395. Sounds like a great tour! Tell your participants to stop by the garage sale on their way! Help us share their stories! Support us on Kickstarter! !